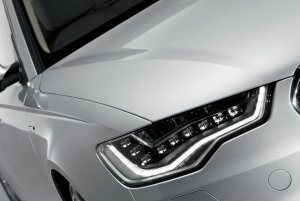 The new Audi A6 is all is being launched world’s first executive saloon to feature all-LED headlights. Available as an optional alternative to the more familiar halogen headlight bulbs or bi-xenon HID lights, the advanced LED units emit a strong white light that is similar to daylight colour, and use just 40 watts of electricity each, making them similar to HIDs for power draw. LED bulbs big advantage is thier durability, and extremely long life. The All-LED bulb headlights are optional on the new A6 Saloon and include main headlights with cornering lights and daytime running lights. The A6 Saloon is the fourth Audi model available with all-LED headlights, after the R8 (which was the first ever car to feature them), the A7 Sportback and the A8 luxury saloon. The sophisticated LED units use just four one-chip and five two-chip LEDs to create dipped-beam light, and 24 white LEDs to make up the daytime running lights in each headlight. This keeps power consumption and maintenance down, and assures an excellent service life. The new LED lights use adaptive light control and high-beam assist, which give maximum visibility without the risk of dazzling other road users. However, you will pay for the privilege. The A6 Saloon is available from £30,145 (2.0 TDI SE). The LED headlight option costs £2,710 extra. At the moment, LED headlights require very careful design of the reflectors, lenses and control systems, so there are no aftermarket LED headlight upgrade kits yet, but as LED output increases, we may see LED bulbs available as an alternative in standard bulb sizes. LED bulbs are available for a wide range of automotive uses, including brake, tail, sidelight, indicator and interior bulbs, where the light output can match traditional halogen car bulbs.